Trimble introduced today (February 10, 2015) the R1 GNSS receiver, a pocket-sized, standalone, single-frequency (L1/G1) receiver that works with iOS, Android or Window mobile handhelds, smart phones, and tablets using Bluetooth connectivity. When paired with a smart device, the receiver/antenna combination adds GNSS geo-location capabilities to transform consumer devices into high-accuracy mobile data collection systems. The 44–parallel channel receiver can track GPS, GLONASS, Galileo, BeiDou, and Quasi-Zenith Satellite System (QZSS) signals. With the evolution of smartphones and tablets, more field workers now have access to positioning technologies for geospatial data collection. The Trimble R1 provides them with the option to collect data and inspect or manage assets using smart devices without an integrated high-accuracy GNSS receiver. 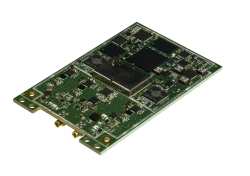 Expected to be available in early March 2015, the R1 receiver can also process correction data on four parallel channels from a variety of sources: satellite-based augmentation systems (WAAS, EGNOS, MSAS, GAGAN), Trimble’s ViewPoint RTX correction service, QZSS, and virtual reference stations (VRS). The unit has a one-hertz update rate and typical time-to-first-fix (TTFF) of 45 seconds. According to the company, adding the optional Trimble ViewPoint RTX correction service — delivered via cellular data network coverage or over satellite in remote locations — enables users to achieve reliable sub-meter accuracy. 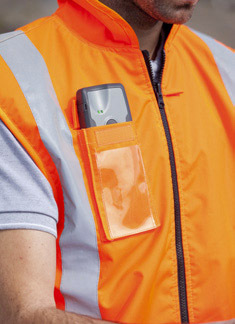 Trimble says the compact receiver weighs 6.5 ounces (187 grams), has a 10+-hour battery life, and can be carried in a vest pocket, attached to a belt using the optional belt pouch, or pole mounted. The receiver also integrates with Trimble TerraFlex, Trimble TerraSync, and Trimble Positions mapping and geographic information system (GIS) field software. "The addition of the R1 GNSS receiver expands our portfolio to address the needs of organizations that have adopted a workplace Bring Your Own Device (BYOD) strategy for their businesses," says Alain Samaha, business area director of GIS and software for Trimble’s Geospatial Division. "Our focus is to provide customers with a variety of options and flexibility when it comes to mobile device deployment and authoritative data collection to increase productivity and improve operations."